Over the last couple of weeks, InterMarine crew has been busy delivering the vessels that were bought during last month's boat shows. The Miami International Boat Show and the Yachts Miami Beach shows were an awesome success in every way. Here is one highlight from the Miami Boat Show. The Cardona family had been searching for the perfect boat to suit their family after having owned a Bayliner bowrider and a sailboat (both have been sold). They missed boating, and were ready to get back on the water. They found exactly what they were looking for aboard their brand-new Chaparral 21' H20 with a 240-HP Volvo Penta engine. This zippy bowrider offered them enough power and space to boat with their three kids and a few of their friends. We took the boat out on a Water Test a week after the show, and it was love at first ride. Even though it had been raining all day, the sun came out halfway through the Water Test- how's that for a good omen?? The Cardonas knew they had found the perfect boat, and took delivery the very next day. 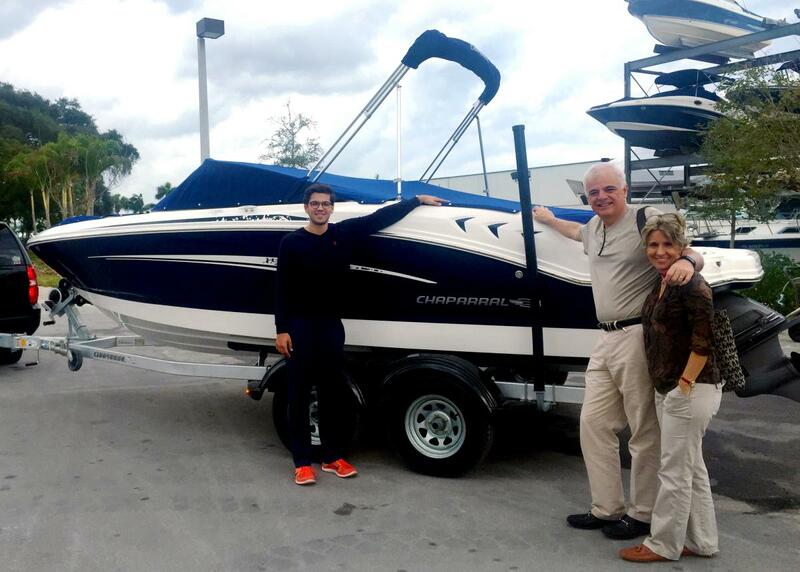 THANK YOU to the Cardonas and WELCOME to the InterMarine family of boaters!